The perfect solution to eliminate weeds in your garden. Suppresses and controls weed growth in borders and under paving, paths and decking. Ideal for landscaping with chipped bark, organic mulches and decorative gravel. Creates a weed-free base for garden designs. Retains moisture so reduces the need for watering, helping plants grow stronger and healthier. Size 8m x 1.5m roll, 50gsm polypropylene material. 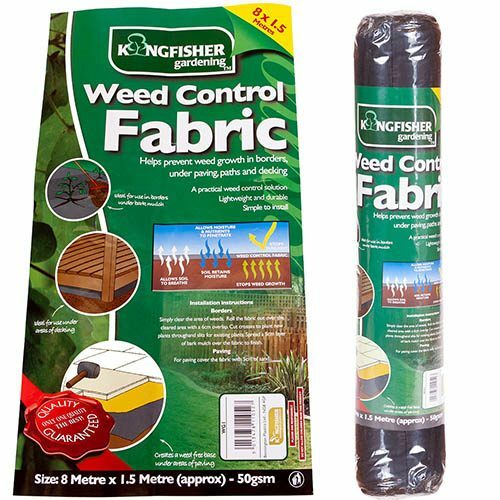 Weed control fabric makes the ideal ground cover and weed suppressant for all of your landscaping design projects and garden planting needs - an essential item for any size of garden make-over. By creating a weed free base, your designs are easier to achieve and so much simpler to maintain! Use under paving, paths and decking and in borders for superb weed control and to make maintenance of garden areas so much easier. By controlling competing weeds by cutting out light, your existing garden plants are allowed to grow to their full potential. The permeable ground-cover membrane is easy to plant through and the fabric allows water, air and nutrients into the soil, and also allows the soil to breathe while at the same time retaining much needed moisture. Supplied as an 8m x 1.5m roll of 50gsm polypropylene material, helps prevent weed growth in borders, paving, paths, decking and under bark mulch.